Killing Kennedy is 2013 American television film, based on the 2012 non-fiction book of the same title by Bill O'Reilly and Martin Dugard, and starring Rob Lowe, Will Rothhaar, Ginnifer Goodwin, and Michelle Trachtenberg. The movie dramatizes the presidency and assassination of John F. Kennedy, as well as the life of Lee Harvey Oswald in the years leading up to the assassination. It premiered in the US and Canada on National Geographic Channel on November 10, 2013, followed by the various European National Geographic channels a few days later. It was first shown on terrestrial TV in the UK by Channel 4 on November 23. 2013. The plot follows the rise of John F. Kennedy (Rob Lowe) as he becomes President of the United States. As Kennedy's career shapes, Lee Harvey Oswald (Will Rothhaar), a former Marine, begins to grow disillusioned with America. Their paths ultimately cross and results in Oswald's assassination of Kennedy. After the success of Killing Lincoln, National Geographic Channel announced it would produce a film adaptation of Killing Kennedy. In May 2013, it was announced that Rob Lowe was to play President John F. Kennedy, Ginnifer Goodwin would play First Lady Jacqueline Kennedy, and Michelle Trachtenberg would portray Lee Harvey Oswald's wife Marina Oswald. Goodwin used intimate photos to better portray Jackie Kennedy and was concerned "to do her justice and to play her as accurately as possible without ever doing an impression of her." Costar Rob Lowe said of seeing Goodwin in the pink Chanel suit, "It made it real. If I were under any illusions about what we were doing, seeing her in that iconic moment was, I would say, sobering." While portraying Marina Oswald, Trachtenberg consulted her Russian-born mother for help in speaking Russian. On its original airing, it drew in 3,354,000 viewers, averaging a 1.1 rating with adults in the 25-54 demographic. The viewership broke the record previously held by Killing Lincoln which averaged 3,351,000 viewers. Killing Kennedy received mixed to negative reviews from both viewers and critics. ^ "TV listings, November 10, 2013, at 8:00pm: Killing Kennedy". National Geographic Canada. Retrieved 24 Nov 2013. ^ "TV listings, November 12, 2013, at 9:00pm: Killing Kennedy". National Geographic UK. Retrieved 24 Nov 2013. ^ "TV listings, November 17, 2013, at 22:00: Killing Kennedy". National Geographic Denmark. Retrieved 24 Nov 2013. ^ "TV listings, November 17, 2013, at 22:00: Kennedy-mordet". National Geographic Sweden. Retrieved 24 Nov 2013. ^ "TV listings, November 20, 2013, at 20:40: Killing Kennedy". National Geographic France. Retrieved 24 Nov 2013. ^ "TV listings, November 22, 2013, at 21:05: Killing Kennedy". National Geographic Germany. Retrieved 24 Nov 2013. ^ "Bill O'Reilly's 'Killing Lincoln' Sets NatGeo Ratings Record". Inquistir, Ld. The Inquistir. February 21, 2013. Retrieved February 24, 2013. ^ Hibberd, James (February 18, 2013). "'Killing Lincoln' gives NatGeo record ratings". Entertainment Weekly Inc.. Retrieved February 24, 2013. ^ O'Connell, Michael (November 11, 2013). 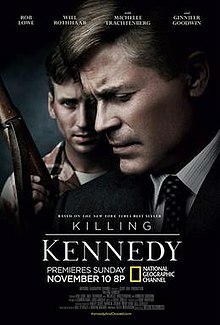 "TV Ratings: 'Killing Kennedy' Edges Past 'Killing Lincoln' Record With 3.4 Million Viewers". The Hollywood Reporter. Retrieved October 16, 2014.